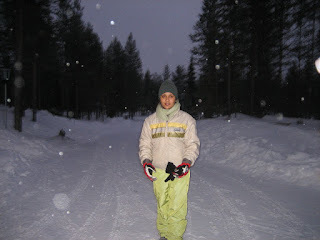 Srijana in Barcelona: "A trip to Finland"
For the new year 2007, we were in a trip to lapland along with other 25 friends. I had great and amazing experiences there and probably all of those experiences were for the first time. Being in the place where it was dark for almost all time during winter, seeing the real Santa Clause and the Santa Clause village, seeing the line where Artic circle falls, seeing blue lights, doing snow mobile, sledding, walking over the river which was frozen, reindeer sledding, feeding reindeers, having drinks from snow bar, covering whole body with snow and many more things were my first experiences. 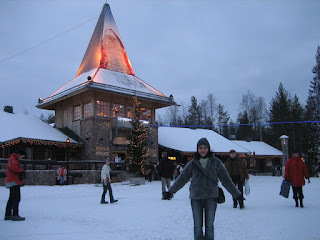 I had a great time there in Finland which will be my life time memory. Enjoying the blanket of snow. Infront of the Santa Clause house (the blue line above me marks the artic circle). Did you say "seeing the REAL Santa Clause" ?? I went through yr first latest article. it was great. But When r u coming bcoz our motherland Nepal is seeking help frm her children around hte world. mam its a long time! Are you being eaten up by the piles of data?